“In previous versions of the Livestream app you were required to turn your device to ‘landscape’ mode (horizontal) in order to broadcast. There are some benefits to using the camera horizontally but the primary reason we locked it was because ‘portrait mode’ would have resulted in a vertical video, which most users don’t like. However, there are some fundamental problems with using the camera in landscape mode. First, if you’re broadcasting a live event for any length of time that exceeds a few minutes it can be tiring to hold the device horizontally. It is also inconvenient to chat with your audience when the keyboard and messages are overlaid on top of the video. 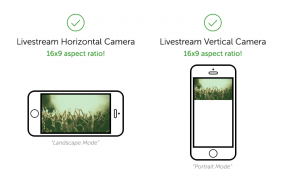 If, for some reason, you really like vertical video, don’t fret. The new Livestream app offers you the option of switching between portrait and landscape modes. So, you can still make skinny videos with black bars on the sides if that’s your thing. The Livestream producer app is available as a free download from the App Store.